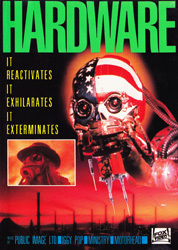 In the ravaged land of a post nuclear war UK, a soldier (Dylan McDermott), purchases some robot parts from a trader in hopes of giving them to his apartment bound girlfriend (Stacey Davis) as a Christmas present to use her in sculptures. What Moses doesn’t realize is that the robot, the M.A.R.K. 13, isn’t as dead as advertised. Now partially reassembled with the help of some metal sculptures, it begins to kill anyone and everyone it can with drills, saws, and a euphoria inducing neurotoxin. It’s truly a gift that keeps giving. If you need to inject in a little utter bleakness into your holidays, then this is your film. The world the characters inhabit is on a slow ride to death and the arrival of the M.A.R.K. -13 (a pretty clever bit of naming, when they reveal why it’s called that) only serves to hasten what was going to happen anyway. It takes the cyberpunk milieu and strips it of all its slickness to reveal the rusty spot welded heart underneath. It’s not a pleasant film, there is very little humor along to way, which makes the oppressive tone somewhat overbearing by the end. It’s has a great soundtrack featuring Public Image Ltd., Motörhead and Iggy Pop. It’s a gorgeous looking film that doesn’t really have much in the way of a plot but the setting is filled with interesting details and a group of fascinatingly damaged characters.